A Korean man with extensive criminal convictions shot a police officer with a homemade gun, killing the officer. The projectile entered through the officer's shoulder and penetrated his lung. 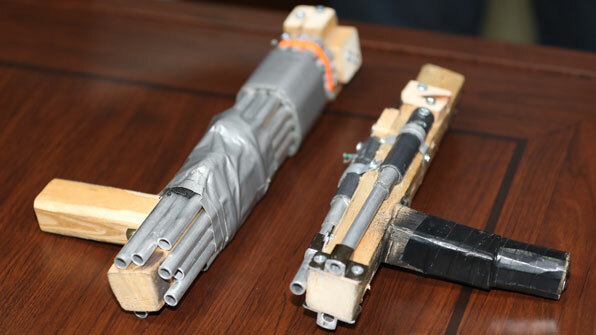 The gun was crudely made with pipes held together by duct tape to some 2x2 wood. It used a round metal ball as the bullet and propellant was made by collecting powders from fireworks. So the general construction is similar to that of a musket. Such homemade guns are not common, but do show up occasionally in South Korea. Word is that a lot of Korean websites with any information that might be used to build homemade guns are getting scrubbed. For those who are wondering, South Korea has one of the toughest laws when it comes to private gun ownership. All buyers must go through extensive background check and exam. 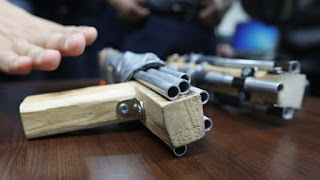 Shotguns can be purchased, and must be stored at police stations, and can only be checked out during daytime. There is restriction on what kind of ammunition can be used as well. Any BB gun with bigger than .177 caliber must be stored at police stations as well. There are some rimfire pistols, but the buyer must belong to a shooting club, and the gun needs to be stored at the club or police station. Even with such constricting laws, South Korea is not completely free from gun related incidents. In the last 10 years, there were almost 20 incidents where gun was used in either homicide or suicide, with perpetrators ranging from average gun owner to military servicemen and police officers.